I have covered the sport of bicycle racing for 20 years and find it endlessly fascinating. The sport, like much photography, is all about improvisation. No moment is ever the same. I know. 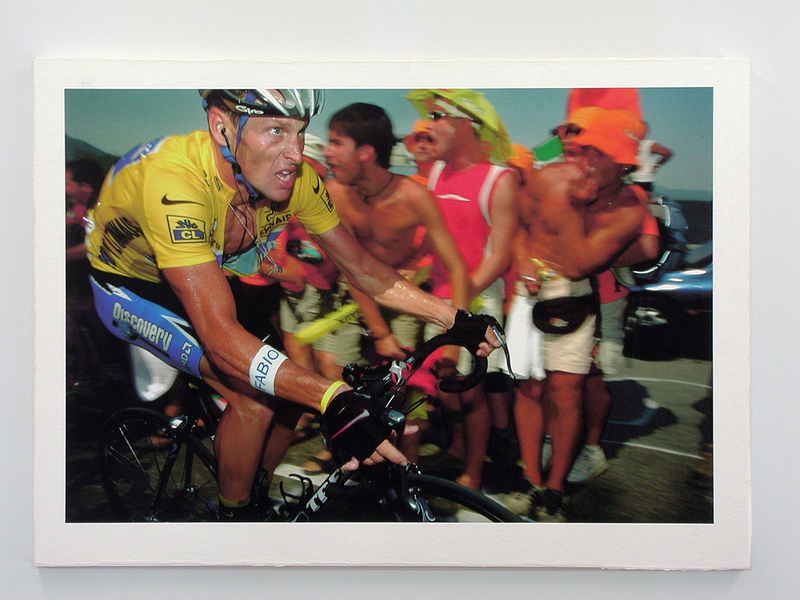 I have tried to recreate certain moments…and I have always failed.On this day during the 2006 Tour de France, I positioned myself with a pack of crazy Basque fans in the Pyrenees. They are easy to pick out as they are always dressed in orange, are always drinking too much and yelling even more. I took many pictures of the cyclists as they passed that day. Some worked better than others as I was getting pushed and shoved constantly.Peering over the crowd, through the police motorcycles that led different groups of riders, I finally got a glimpse of the yellow jersey, of Lance Armstrong. I knew this would be one of my last chances as he announced his retirement after the 2006 raced finished. I don’t remember what I saw exactly as he sped by in a blur and I barely had time to raise my camera to eye-level. This picture serves to remind me.